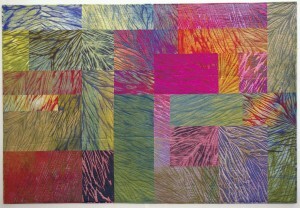 Fiber art can be an elusive thing to define. In past Internationals, we’ve featured glass sculpted to look like knitting, baskets spiked with plastic cable ties, and even a video of an artist interacting with a fiber artifact. What is fiber? What is the International about? To explore that idea and celebrate the month leading up to the FI2016 Entry Deadline, we’re going to dedicate this blog page for the next few weeks to exploring some of the many interpretations of fiber art that we’ve loved seeing in past Internationals. Hopefully, we’ll encourage you to include your own work in our festival of fiber, and dig into the possibilities of the medium! 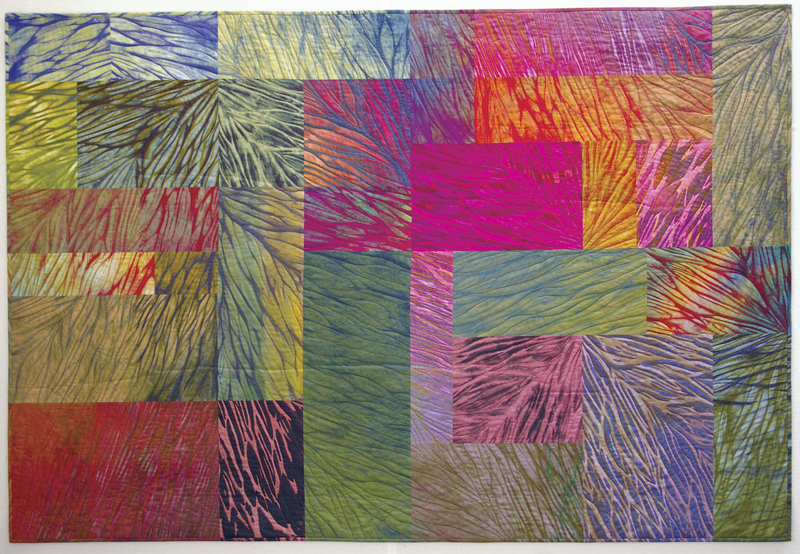 We’ll start with a traditional technique used in an extraordinarily painterly way by one of the Fiberart Guild of Pittsburgh’s own members, Jan Myers-Newbury. Dyed and discharge cotton, Arashi shibori, machine pieced, machine quilted. Shibori, at its most basic, is a Japanese cloth-dying technique based in binding, stitching, folding, twisting, or otherwise putting pressure on cloth so that parts of the cloth receive dye and other parts resist it. According to its Wikipedia entry, shibori dates back to the 8th century in Japan. 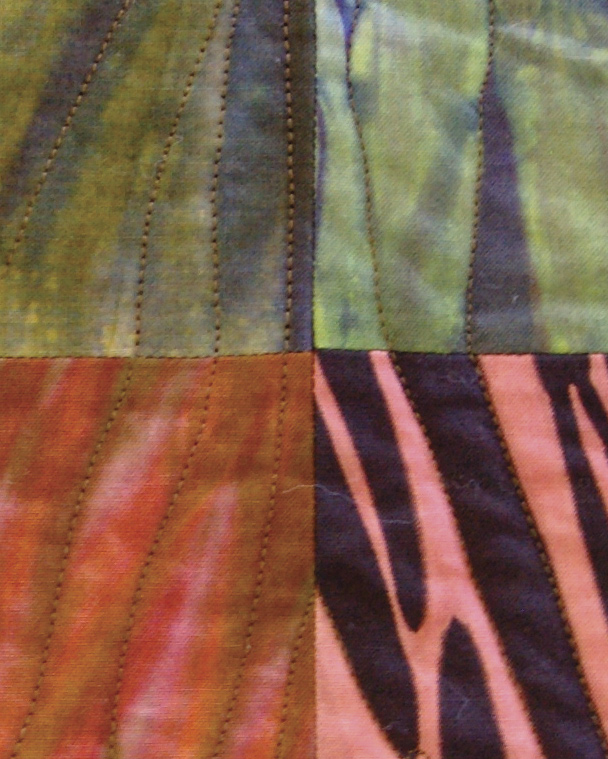 It’s a favorite technique among many fiber artists because of the infinite pattern possibilities available by simply using fabric, string, and dye. Arashi shibori, the variation that Jan has used here, is also called “pole-wrapping” shibori. The fabric is wrapped up a pole and then bound with string, resulting in the diagonal lines you see in the piece. Jan’s incredible eye for color and detail can be seen here in the careful layering necessary to get these vivid, multi-hued results. The resulting diagonally-striped fabric blocks are mindfully placed so that some of their bright branches flow organically into their neighbors and some crackle uneasily away. You can see in the detail shot how well the flow of the shibori rivulets is emphasized by the lines and furrows created by the machine quilting that leads one block into another. Shibori is a traditional technique – but this is a great example of how something that’s rooted in tradition can be used to explore an abstract concept. When a traditional technique like shibori is expertly used, the technique itself vanishes. We forget the pole, the string, the careful wrapping and unwrapping and become lost in the contemplation of the moving lines, the shifting colors, the sense of both flow and disconnect; viewers gazing into the heart of a wildfire that subsumes technique for its own brilliant ends.